When your personnel is attempting a mission, reveal a personnel from hand to make him or her gain one of the revealed personnel's skills until the end of that mission attempt. Place the revealed personnel on top of your deck. 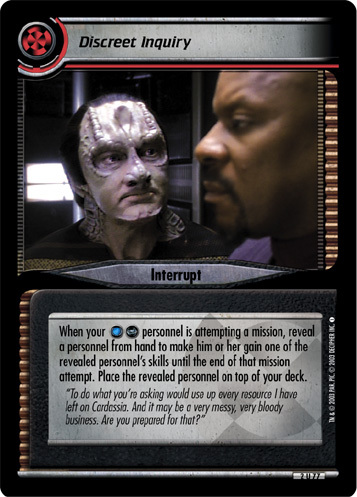 "To do what you're asking would use up every resource I have left on Cardassia. And it may be a very messy, very bloody business. Are you prepared for that?" Characteristics: manipulate your deck, enhance your skills (other cards). Requires: affiliation, Deep Space None related. There are 9 entries for Discreet Inquiry (ST2E 2 U 77) at the Tradeplace (6 haves and 4 wants). Click here to see all trade list entries for this Uncommon card! Also see here for all trade lists with any card fom "Energize".